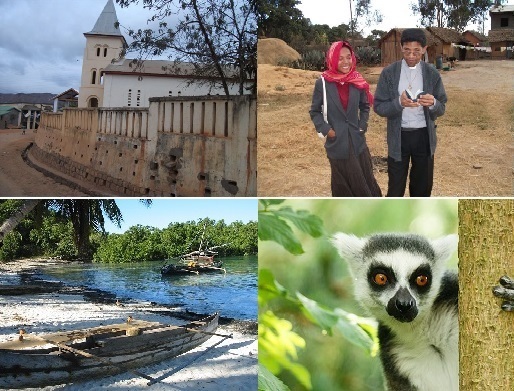 Our link with Reverend Olivier and his parishes in Madagascar is very strong and our Madagascar group meets regularly, both to manage various projects and organise fundraising. Madagascar Lunches take place about once per month and everyone is welcome to join in! The aim is to hear about and discuss our various projects - and raise funds; we're talking about £5 per person - to include the cost of the lunch. Don't be shy, you don't even need to be a member of the congregation, just contact Mike Swain on 07956 638928, to find out the date and venue for the next lunch, or indeed if you want further information about our link and projects. The word became Flesh(John 1:14): ALL PEOPLE FROM AMBATONDRAZAKA ARE HAPPY TO GREET YOU FOR THE OCCASION OF CHRISTMAS DAY AND THE NEW YEAR 2019.As the Queen Elizabeth 2 sayd that the Gospel of Jesus Christ is never out of date,so we all always live through the grace of the Incarnation.The Word making Flesh is the source of Life.Thanks God to give us His Grace so the Church always live through the evangelism and the sacrement of Grace. God bless you all. to feed the Children on 11th March. Rice and Pork with vegetable. How pleasant picnic with the feeding. They always show their happiness. they ate rice and chicken. in Amboasary on 15 April. Sorry for the picture not clear. After playing they took a lunch. a Church in the parish of Andreba. The number of Children increased. Feeding project on 06 May. There are some Churches that I didn’t receive a report from yet. to help for increasing physically and intellectually especially spiritually. The grace of our Lord Jesus Christ,the love of God the Father and the fellowship of Holy Spirit be with you all. 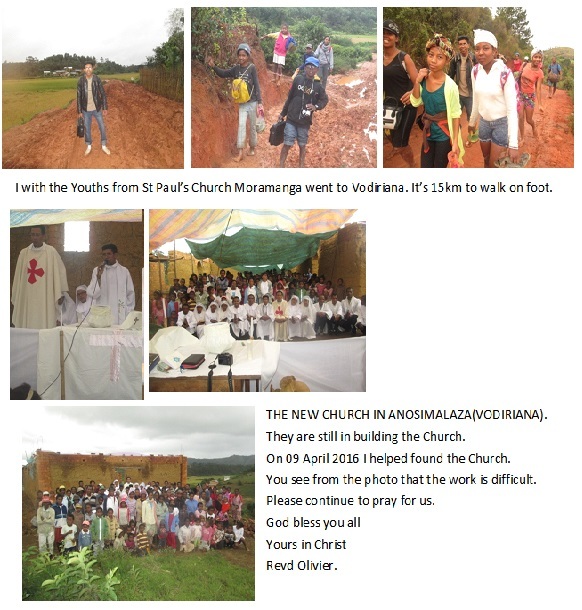 I want to send you some pictures about the feeding project in St James,my photos with MgrTrevor,thevisite of Mgr Trevor with one Bishpo from Australia and all Bishops of Episcopal Church in Madagascar to the Malagasy President HeryRAJAONARIMAMPIANINA,and new extending St James Church with new roof supported by you. I was with Mgr TREVOR WILLMUT on the reception at MAHATAZANA RESTAURANT after the consecration of Right RevdSamy to be as an assistant Bishop of TulearDiosese. Mgr Trevor visited with all Bishops of Madagascar to the President of Madagascar’s Republic,His Excellence Hery RAJAONARIMAMPIANINA on 27 February 2018. The extension of Church of St James in Ambatondrazaka has already covered the roof. All roofs are supported by Blean Parish plus here are the windows of the church. We think that the extending Church is specialized to memory of our 10th of our Link.It’s good if the work will be finished before your visit on June and July,so pray for us because there is more things to do. There’re still more things we need supporting.Even though I feel that our all congregations here strive as possible to give and to do somethings as their talent that they have to work of extendningchurch.They do it with enthusiasm and proudly as they’re Anglican.So pray for us. I represent my family and all congregations in my parish and our deanary to present you all our best greeting for the occasion of Christmas day a New Year 2018.We always trust in God.We trust His Great Love showing for us every day and we trust His Unique Slavation in Jesus Christ for ever and ever.So to walk into the 365 days we have God the Father of Jesus Christ and always protect His people.Be strong to serve the Lord and to develop His Church.Grace,peace and prosperity from God upon in you all and protect you to walk in the new year.Message for you in the book of Psalm 121. I forget to tell you that we had a sad news about the family of Georges and Laurette and Germaine.Jim and Sally have known these family because they were received by them.The husband of Germaine called Georges Lock-Tong,father of Georges was dead on last 29 November.Pray for them. The Grace of our Lord Jesus Christ,the Love of God the Father and the fellowship of the Holy Spirit be with you all. It's £1982.52.Thank you very, very much for your help because it is make us to be strong to continue the great work before us. We hope that the new church in Mahatsinjo will become clear, not only by energy but also clear spirituality. So to show you our delighted, we repeat you three times thank ,thank ,thank you. Thanks be to God that we could celebrate the harvest feast in Ambatondrazaka on last Sunday 23 July. Most people came to the church to bring their product and fruit that the Lord blessed them. The money we got in this time is for continuing the work of the extending in Ambatondrazaka. To take a look at our previous Madagascar Link information click HERE to see our old website data.